Enter today to win a FitPro giveaway. Fitpro magazine runs a fantastic spread of giveaways and goodies each issue. Please note: Entrants to giveaways must be FitPro registered members. By entering the giveaways you agree to our terms and conditions. Email addresses may be passed on to contributors and used for marketing purposes. Please do not contact contributors directly for information related to giveaways. Closing date: 31 May 2019. You must be logged in to enter the giveaways. Log in to enter. Brand new for 2019, lux athleisure brand Evveervital offers fashionable, functional and eco-friendly activewear using the highest quality materials and innovative development. British in design and infused with global inspiration, this is an exciting new collection of clothing that is the ideal choice for both active and leisure time. Available for giveaway is the Evveervital Abbey Sports Bra; a staple item for the keen gym-goer. Designed to act as a second skin, this stylish and flattering bra features breathable details on the back straps to keep you cool at all times. Seamless and soft to the touch, it also features a wide and supportive waistband for optimum comfort and performance. 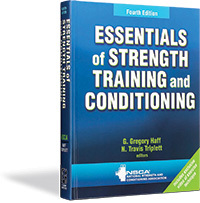 Developed by the National Strength and Conditioning Association and now in its fourth edition, Essentials of Strength Training and Conditioning is the essential text for professionals and students. This comprehensive resource, created by 30 expert contributors in the field, explains the key theories, concepts, and scientific principles of strength training and conditioning, as well as their direct application to athletic competition and performance.?? The scope and content of Essentials of Strength Training and Conditioning (Fourth Edition with web resource) have been updated to convey the knowledge, skills and abilities required of a strength and conditioning professional, and to address the latest information found on the Certified Strength and Conditioning Specialist (CSCS) exam. The evidence-based approach and unbeatable accuracy of the text make it the primary resource to rely on for CSCS exam preparation. The latest wireless headphones from Plantronics are flexible in design and perfectly created for sporting/fitness enthusiasts. Made from materials that are both sweatproof and waterproof, with maximum comfort in mind, they are incredibly stable. The secure-fit ear tips will enable you to tackle your toughest workouts yet. New technology such as the Always Aware™ feature allows you to stay connected to your surroundings, enjoying safer training and listening in any environment, and the seven hours of wireless power means that you can move more and charge less. For added personalisation, download the BackBeat app to create a unique listening experience, with on-ear controls for timer/stopwatch control, playlist selection, call management, track skipping and volume adjustment.